Our congregation plays an active role in the direct support of some of the less fortunate members of the local community. Our church has a rich history dating back to 1833 when only eighteen people settled in the area around Frenchman's Bay. All existence is because of God, and there is purpose in it. If we needed to encapsulate the teachings of our religion we might do it this way. In 1833, eighteen people in the sparsely settled area around Frenchman's Bay struggled to preserve their Presbyterian faith while building a new culture in a strange land. Two years later, in 1835, the Reverend R.H Thornton held services on alternate Sundays in two log schoolhouses in the area. Erskine Presbyterian Church was established by the vision of a handful of determined Christians whose faith empowered them to overcome the obstacles of their harsh life and build not only for themselves but for the future of their new land. By 1854, two churches served the people of the community on sites still used by our congregation today. In 1883, Erskine Presbyterian and Dunbarton Presbyterian amalgamated under the name Dunbarton Presbyterian. Our historic sanctuary was built in the village of Dunbarton. 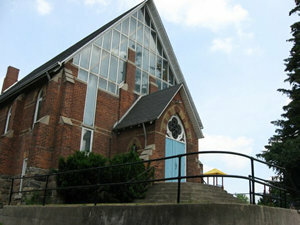 In 1925, the congregation entered the United Church of Canada. 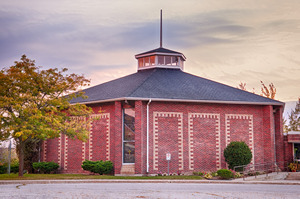 In 1973, following a fire which gutted the Dunbarton sanctuary, Dunbarton and Fairport United Churches came together to rebuild (as seen above) and form our present congregation. Our rural charge has become a suburban church, in the center of a rapidly developing, dynamic community. With heritage spanning over 150 years, we of Dunbarton-Fairport, most of whose roots are in other places, face a challenge akin to that of our forebears. We look to the past for inspiration and to the future with hope and enthusiasm. All congregations must establish an organizational structure that allows them to deal with the many aspects and responsibilities of congregational life; this church is no exception. This page outlines the various administrative groups of the church, and a brief look at their areas of responsibility. 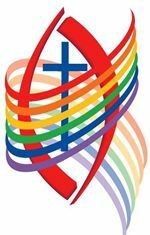 This group is responsible for overseeing all aspects of congregational life and, through the various groups that form the Official Board, bring about the necessary decisions and actions required to fulfil the mission of the congregation. In addition to these decision-making and co-ordination duties, the Official Board is responsible for appointing a Personnel Committee that is to provide liaison between the Staff members and the Session. The Board consists of all members of the Session, Stewards and Trustees, the Presbytery Delegates, and representatives from the Worship Committee, C.E. Committee, the UCW (United Church Women) and the Youth Groups. The executive for this group are all elected by the congregation at the Annual Meeting; the three positions Chairperson of the Official Board, the Vice-Chairperson and the Secretary. The Session is responsible for the spiritual well-being of the congregation. They meet regularly for worship and Bible study, fellowship, and to seek together to discern what God would have this church to do. Session makes itself aware of the needs of the community, and of the United Church's efforts in the broader community, and identifies to the congregation particular missions which the members of Session believe God would have the congregation undertake. Their regular meeting time is the first Thursday of the month at 7:30 p.m. Responsible for all aspects of worship, within and without the Sanctuary, in accordance with the United Church Manual. It establishes and administers policies covering aspects of the Service of Worship, such as Communion, Baptism, and Marriage, as well as the Order of Service, Sermon Topics, and so on. The United Church Manual is used as the basis and guideline in these matters. Meetings are held on the second Tuesday of the month at 11:00 am. This committee's mandate is to ensure that the children and adults of this congregation have the opportunity to participate in a variety of programs, such as church schools, mid-week programmes, adult education (excluding membership classes) and Vacation Bible School. Meetings are held on the last Wednesday of the month at 7:00 p.m. Receive and disburse monies. The Treasurer will pay salaries and associated expenses, and monies will be spent in accordance with a budget of authorized expenses put forward annually by the Official Board and approved by the congregation at the annual meeting. Oversee and authorize expenses for the care and maintenance of the property. Regularly educate the congregation as to the financial health of the church, and soliciting donations in a way so that the congregation has every opportunity to see the financial health of the church. The Trustees hold the title and deed to all church property In Trust for the United Church of Canada, and conduct their affairs in accord with the United Church Manual. Arrange rentals for the use of the property, maintain the property, and supervise the Office Manager in maintaining appropriate records for these purposes. Oversee the operation of the cemeteries (the Erskine Cemetery, located on the east and west sides of Fairport Road on the north side of the intersection at Finch Avenue, and the historic Fairport United Church burying ground located on the west side of Liverpool Road in South Pickering), supporting the day-to-day work of the Administrator, and taking all policy decisions. Meetings are regularly held on the third Wednesday of the month at 7:00 p.m. Responsible for the care and repair of the building structure. Works closely with the Stewards and Trustees to maintain the church property.